Social media management dashboard HootSuite has announced its three millionth sign-up, with a man called Alan from Sao Paulo laying claim to the magic milestone. Launched in 2008, HootSuite is a platform that lets users manage multiple social networks through a single dashboard, and the Vancouver-based company has grown into a global social media brand used by consumers and companies alike. The latest announcement comes only six months after we reported on its previous big milestone, when it hit two million users back in July 2011. We’re told that over 700 million messages have been sent through over 6 million social profiles, with users able to manage multiple accounts from the likes of Twitter, Facebook, Google+, LinkedIn, Foursquare, MySpace, WordPress and Mixi. Indeed, the latter of these is a significant inclusion, given that it’s one of Japan’s biggest social networks – a country that’s now HootSuite’s second biggest market. HootSuite’s dashboard is available in five languages – English, French, Italian, Japanese, and Spanish – and the company’s top ten ranking countries are: (1) USA, (2) Japan, (3) UK, (4) Canada, (5) Brazil, (6) Indonesia, (7) Netherlands, (8) Spain, (9) Mexico, and (10) Australia. However, with almost 40%, the USA is far-and-away the platform’s biggest single market. HootSuite also works with Tumblr, Constant Contact, Flickr, Formulists, Get Satisfaction, Summify and YouTube via HootSuite Apps, but its growth over the past six months could perhaps be put down to the addition of new social networks and features including Facebook Groups, Google+ Pages, LinkedIn Company Pages, and LinkedIn Groups. 80% of HootSuite users access the dashboard from the Web-based platform, while the other 20% opt for the mobile apps. The company’s mobile data show that 57% of users access the dashboard via iPhones, 26% through Android smartphones, 14% use iPads and 3% using BlackBerry. 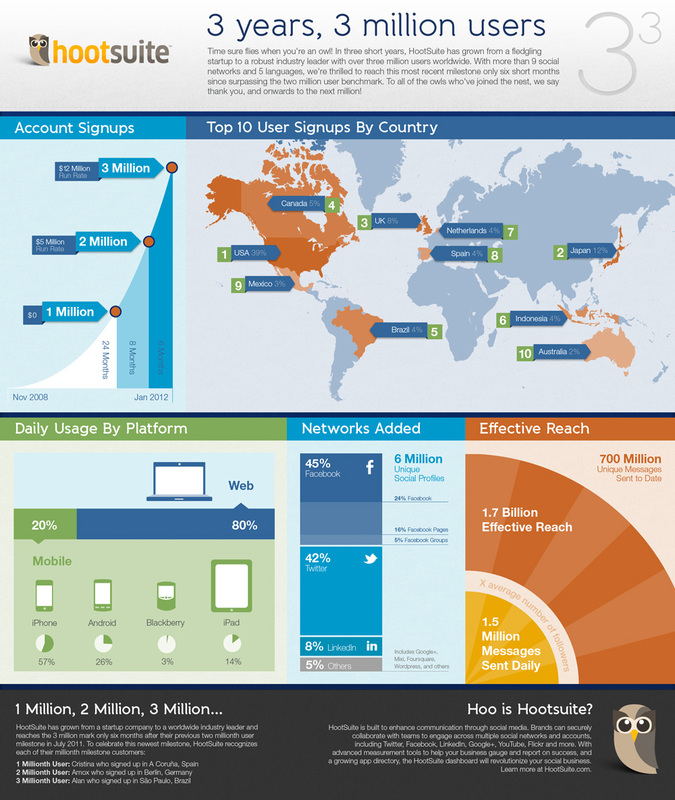 To illustrate key trends and patterns, HootSuite has produced this infographic highlighting signup milestones and revenue and other key metrics. Google+ only launched last June, and it only actively started welcoming brands in November, which helps explain why it factors so lowly, plus it still doesn’t have a solid API for third-party applications to tap into.